The US army, still present in Afghanistan. Photograph thanks to US Army. Reading an article recently from E-Sharp magazine (http://www.esharp.eu/), I was reminded of a well known Taliban saying, “The Americans may have the wristwatches, but we have the time”. It is now coming up to 9 years since the invasion of Afghanistan. Obama (and supportive European leaders), face a basic problem. They justify their presence with their mantra of “things would fall apart if we were not there; we are protecting the locals from the Taliban etc”. This is fine, and indeed holds a strong sense of truth to it. The problem however, is what event is going to happen to change this situation. 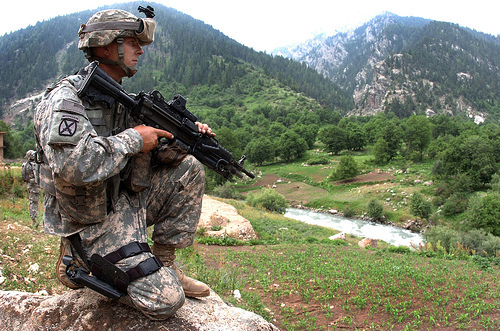 What is going to happen that will make our troops withdrawal smooth and painless? Is the Afghan National Army suddenly going to become a lean mean fighting machine? It reminds me of James Burkes (http://en.wikipedia.org/wiki/Jason_Burke) basic point about fighting an idea rather than a physical enemy. Can you defeat an idea, by attacking those who advocate an idea? I suspect not (which is where our “hearts and minds” campaign comes in). This is not an up-beat message, that in all likelihood, whenever we pull out in the foreseeable future bloodshed will follow. The only thing worse than this that I can imagine, is another 5 years of US sponsored bloodshed, that is then followed by a bloody withdrawal. If we have not managed to create these conditions for withdrawal in 9 years, when will we have? If we set a withdrawal date, we look like we are abandoning the people. If we stay we are guaranteeing more of the same. It’s about time we looked for a plan B. Are we sure a Western style democracy is the only way to bring about progression? Are we sure that more troops (for that final push?) are really needed? I do not claim to hold the answers, but it is clear that what we are trying at the moment is not working. I hope, and believe, that the Afghan people can build the country they want without too much interference from Western states. They should decide by themselves but a degree of peace in the streets and a little more security are essential to do that. Training national security forces sounds better than training politicians. What kind of state they want, is up to them to decide once they have safe schools, courts running and basic needs guaranteed. What do you think about today’s Independent front page?